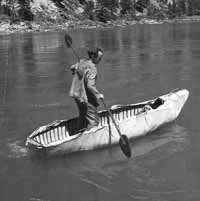 Photo courtesy of the Historical Museum at St. Gertrude, Cottonwood, Idaho Sylvan “Buckskin Bill” Hart paddles on the Salmon River, testing out a prototype of a canoe he designed. Sylvan "Buckskin Bill" Hart received his nickname when he visited a Forest Service station at Mackay Bar on the Salmon River in central Idaho. Hart had been living on the river for two years where he was killing deer and using all parts of the animal to survive. He made clothes out of deer hide, which he wore with the fur on the inside next to his skin. The fur absorbed his perspiration. When he arrived at Mackay Bar, he smelled so bad in his tanned skin clothing that the rangers called him "Buckskin Bill." "These guys are not being replaced," said Megan Murphy, executive director of the Ketchum-Sun Valley Ski and Heritage Museum in Ketchum. "It was an era of men who were loners and wanted to live in solitude. They lived off the land." The museum has an exhibition called "Buckskin Bill: The Last Idaho Mountain Man" on display until March 26. The show features several of Hart's handmade knives, household items and a brief documentary on the hermits of the Salmon River. "It's important Idaho history kids need to know," Murphy said. "People love it." The museum's new renovations have provided spaces for several exhibitions to be on display at one time. New sliding walls and exhibition spaces show off items such as Hart's 60-pound percussion rifle, on which he carved animals. Hart lived from 1906 to 1980. He was born in Oklahoma Territory and was the oldest of six children. During the Great Depression, he left Oklahoma to work in Texas oilfields. He worked toward a master's degree in petroleum engineering at the University of Oklahoma but never finished it. In 1932, Hart and his father arrived at Five Mile Bar on the Salmon River. His father eventually left for a larger city but Hart stayed. Hart tried to enlist in the Army during World War II but he had an enlarged heart, so he worked as a civilian on airplanes in Kansas. He returned to the Salmon River and worked for the Forest Service, making enough money to survive. Managing to live without eviction or conviction, Hart was constantly threatened by the U.S. government, including by the Internal Revenue Service. Hart died of a heart attack in 1980. His outpost is now a popular stop for whitewater rafters, kayakers and anglers who float down the Salmon River. The exhibit is funded by the Deer Creek Foundation, the Historical Museum at St. Gertrude and the Idaho Humanities Council.